We've been waiting for this this camera/audio all-in-one to come out, since we first heard about it. We've also been lucky enough to have one in our office for the past few weeks - and let me tell you - it has blown us away. This is one very slick unit, with perfect UltraHD picture, smooth operation and flawless audio. We've some a few all-in-one units over the years, and they've run the gamete from bad to great - and the AVer VB342 is on the great side of that equation. One of things that really struck us when we first got our hands on it, was just well designed it is. I looks great, and has the wider shape we have come to expect with all-in-one design. It fits perfectly with either single or dual display setup, and is easily mounted. Ultra-HD 4K Resolution Finally the term “Like looking through glass” can be used. The VB342 uses high quality sensors and multi-lens glass to produce the sharpest and most accurate color ever. Audio that works! The sound is perfect, with professionally tuned bass port stereo speakers, that have been optimized for voice communications. Your online participants will sound like they are actually in the room. Excellent voice pick-up even up to 12 feet away. Advanced array microphones, with full duplex speakerphone, effectively capture audio through the entire room. Need to extend it out? AVer has an extension mic specifically designed for the VB342. 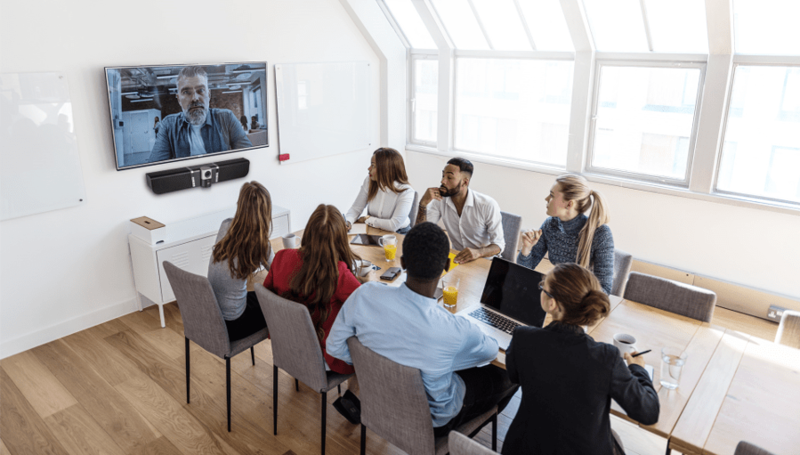 Easy installation & Plays "nice" with your 4K HDMI display USB 3.0 and DisplayLink connection makes for an easy installation for any room or huddle space.